It's a venerable tradition: the in-camera edit assignment. 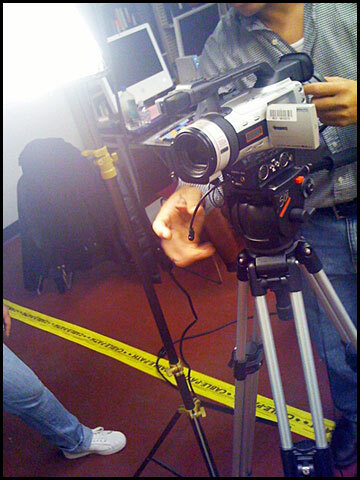 Students in production classes all over the country do it, and it's been assigned for decades. A production team is asked to shoot a subject, but with no post-production: they shoot exactly what they'll show. It forces you to plan ahead, to know your story before charging in, and to get the essential shots. Today, I was the subject of one of these. I had a reasonably good time. I'm generally a willing subject, and will usually do what the director suggests (unless it goes against my nature or ethics). Someone gives me a cue, I talk. Tell me to, and I walk. Pretend to teach someone here. Okay. In a way, it was a good reminder how forced and acted documentary can be: I gave the crew what they wanted, I attempted to project my idea of myself, and it went the way it went. Nothing surprising will be revealed, I expect, and nothing outside the plan will emerge. A good exercise, but a view into what is often the essential problem of documentary work: the mechanism includes a camera or two, a small crew, and an expectation of what will happen. Often, that's really a strange and ineffective tool -- if your goal is to find subtle insights into human nature.